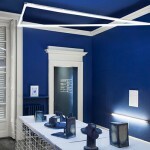 Cafezal is the latest interior design work by talented and most favorite Studiopepe , the Milan-based creative office. 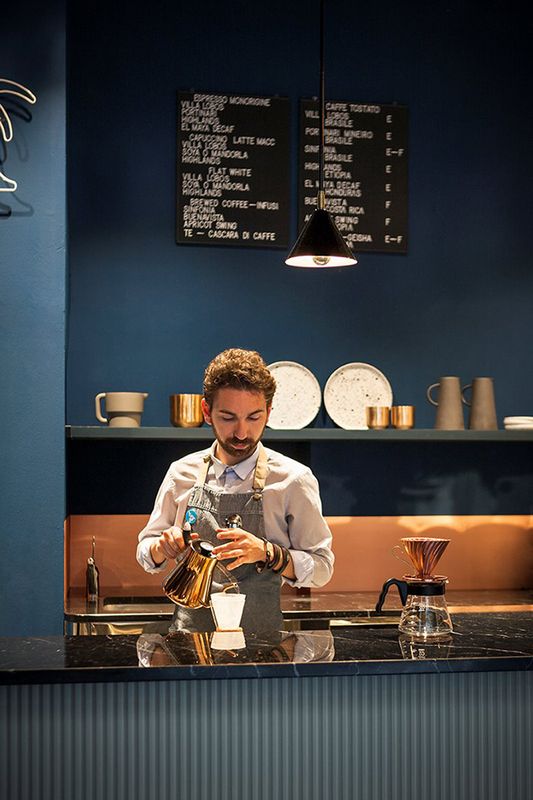 A microgourmet roastery a coffee shop, a blend of Brazilian heritage and Italian lifestyle, has been recently opened in the Milanese Brera District marking what seems the opening of Italy to the third wave coffee culture that has been growing in the past years everywhere. 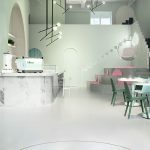 Studiopepe was the perfect choice to shape the “negozio” space and make it appealing evento the more traditionalist Italian ( the first Italian, much-debated Starbucks opened only this fall). 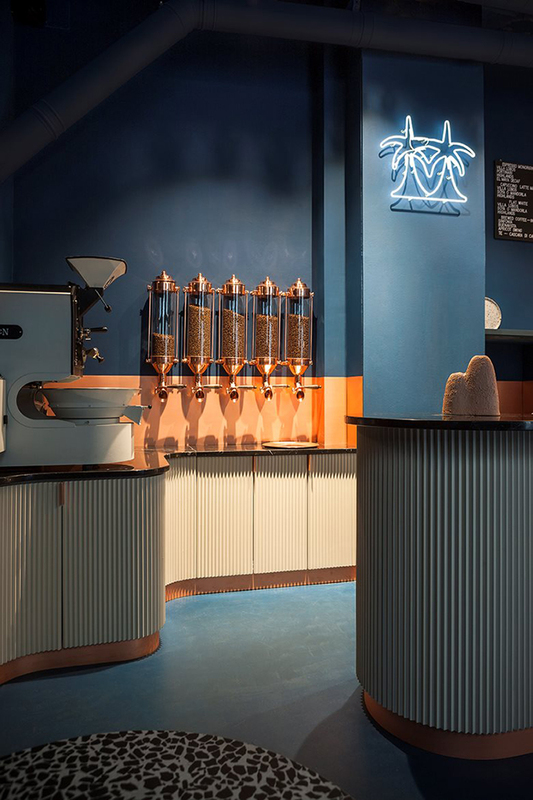 The roastery, a typical Italian spot easy to be found in many cities in the country, has been re-interpreted by Studiopepe as a post-modernist space characterized by a strong yet extremely refined urban atmosphere. 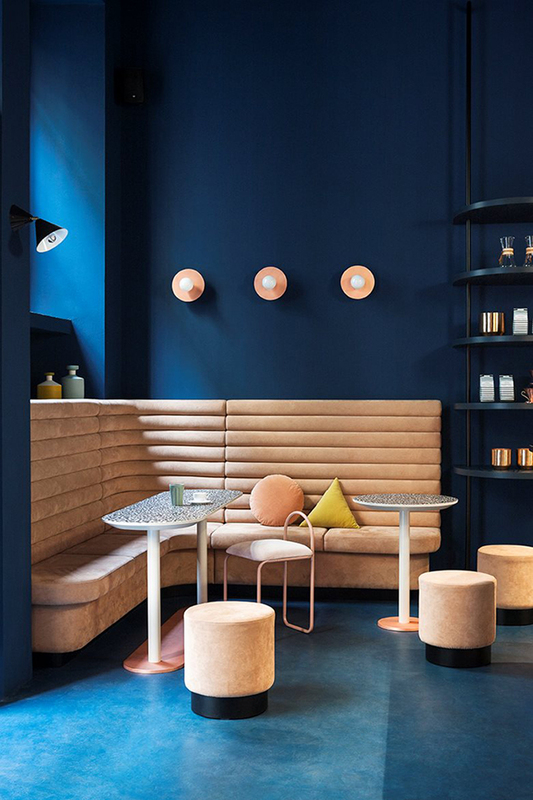 Last century’s Milanese cafes’ atmosphere finds here a more contemporary version defined by the palette deep blue walls and dusty pink seating palette. Black and white terrazzo tabletop and the ribbed paneling add a sense of dynamism to the place. 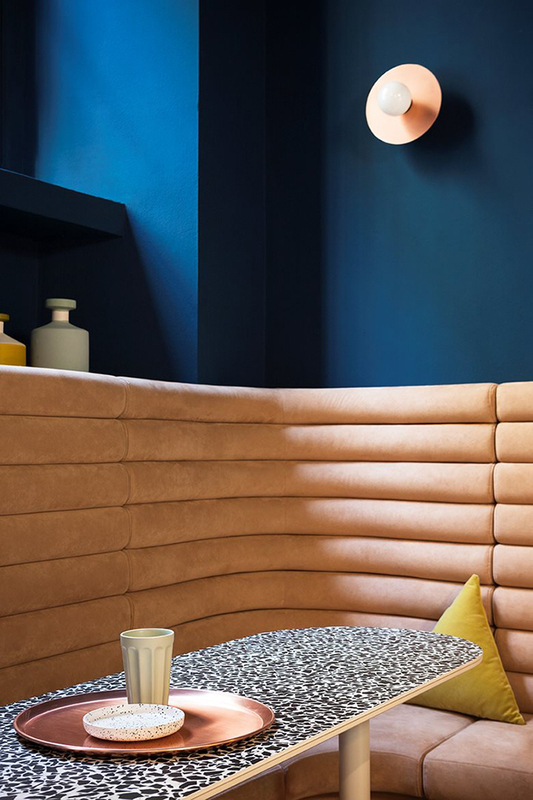 The curved lines of all the design elements grant softness that welcomes and invites customers for a longer compared to the traditional Italian coffee break. 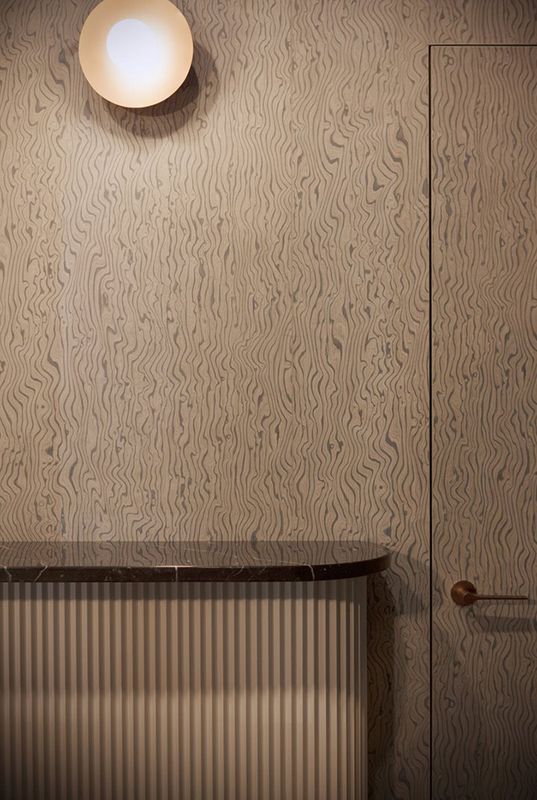 Natural references are present in several elements, like woodgrain-printed wallpaper or the Millennium panels by Cleaf, whose finish reproduces the extreme smoothness and homogeneity of the composition of the spruce. Studiopepe’s projects are also a big hit here at Eclectic Trends. 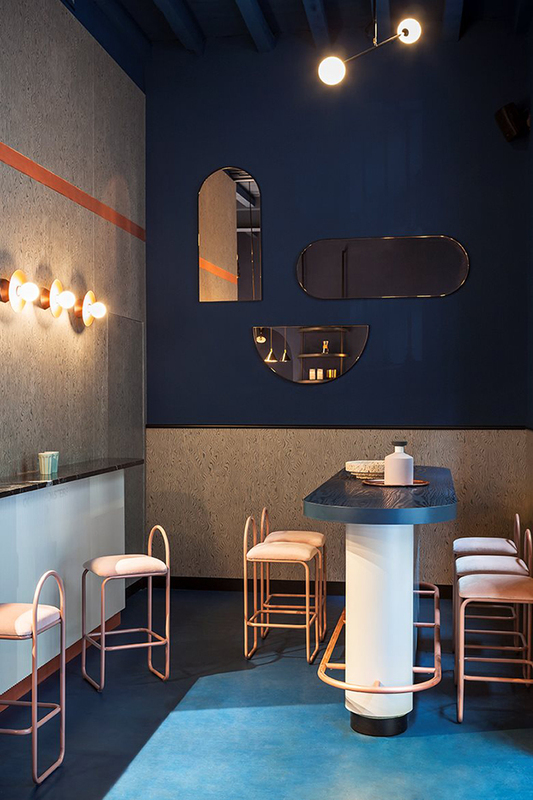 We have been following their work for many years now and it never stops to fascinate us for their talent to translate the latest trends into sophisticated interiors. 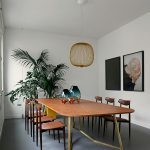 The velvet banquettes as well as the curated surfaces chosen for the projects perfectly embodies the tactility trend we have been talking about so much lately. 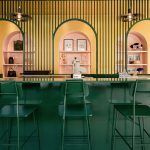 Finally, the Cafezal palette color is very much in line with our forecasting for upcoming SS2019 interior trends.